SX-36, USB audio interface from Fairlight. 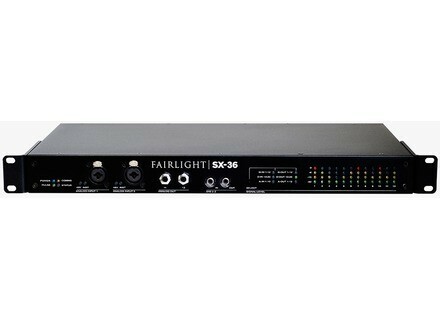 Fairlight will introduce in september at the IBC trade show in Amsterdam the new SX-36 audio interface for post-production Crystal Core systems. The newest audio interface of the SX family is designed for post-production studios using the Fairlight Crystal Core system. It offers several analog and digital inputs and outputs as well as two mic preamps, MIDI and sync tools. The interface can be racked in 1U. Full details are available at eu.fairlight.com.au. The Fairlight SX-36 will be showcased at IBC on september 12-17th. Tone2 FireBird 2 is now free Tone2 updated its FireBird virtual synth to version 2 and makes it available for free. Advanced AudioWaves Track Align Pro Advanced AudioWaves announces the release of its Track Align Pro VST 3 plug-in for Mac OS X, with a special offer until the end of the month. D16 announces Sigmund delay plug-in Sigmund is a discrete 4-line delay plug-in, each featuring its own settings.